Tag Line: Where angels walk the ground and the future is told in song, does a man of low rank have a chance at love with a princess? 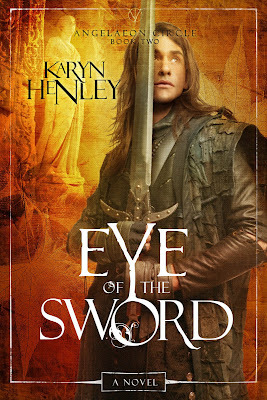 Summary (snagged from Goodreads): In Camrithia, a land of shadows and mystical secrets, Trevin lives to serve King Laetham. But his heart belongs to the princess, Melaia. When the King sends Trevin on on a dangerous quest to find the missing comains—captains in the king’s army—he must leave Melaia to the advances of a swaggering Dregmoorian prince. What I Loved: Eye of the Sword's story moved much more quickly than Breath of Angel did, quite to my liking. I also found that I got into this particular novel's story line easier than I did with the first novel in the series. For me there was less confusion, a stronger plot in place and more adventure to be had, with many new faces to get to know too. You know, there's something about reading into the life of a character with a "lower station," a very stout heart and many questions that they must quest away to find their long awaited answers, that excites me down through my core and keeps me turning pages faster and faster, instead of having to read all about a Princess the whole time. I guess I just love my under-dogs! That said, I think this is why I actually loved this book more so than the first, because it focused on Trevin and his journey to find not only the last two harps and the missing comains for King Laetham and Princess Melaia, but also himself, his heart and more about his dark history. I don't usually read too many books with male leads very often, but I loved the quick manly dialogue and the chance to climb inside the mind of a "lower status knight", if you will. I also loved that there were two tasks at hand for Trevin (finding the two harps and searching for the lost comains) which seemingly stretched him (as the newly named comain of Camrithia) and grew him as a person most worthy of being loved by himself, his comrades and most importantly Princess Melaia by novel's end. Some of my favorite scenes and characters were introduced outside the walls of Camrithia, leaving King Laetham and Princess Melaia behind. I thoroughly enjoyed learning about the Windwings (horses with wings), Windweaver, Seaspinner, Flametender, the gash trade (which involved child trafficking by the Dregmoorians [human trafficking is a serious thing and I loved that Ms. Henley thought to shed some light on it in Eye of the Sword in her own way]), a new way to house souls for ill fated intentions (I won't tell you how), the eye of the sword in Eldarra, new characters like Prince Resarian and the feisty sword maiden, Ollena, both of which I adored. I also love getting to know Pym and Jarrod more in this installment. I hadn't felt a real connection to them earlier on, but now I quite like their characters. Oh, and I just must gush over the swaggering gash running, vomit inducing, Prince of the Dregmoorians. I thought his character was brilliantly vile and I savored reading through each scene where Trevin and him had to face each other. Varic totally made my skin crawl. He is the perfect villain, really. He's charming, deceitful, trying to steal the Princess away from a man of lower status, etc. ((spoiler alert)) I don't like how things went down with Varic. I really don't. Actually, I found it quite disappointing. I think he deserved something a bit more just and sinister, truth be told. To wrap things up: I really felt like I got to know the characters on a much deeper level in this second book of the series than in the first one (Breath of Angel.) I enjoyed getting to know the new characters, seeing the story told through the eyes of Trevin and experiencing all of the plot twists that came about. What I Didn't Like So Much: A few of the fight scenes in the book seemed a little too easy (especially one of the main ones towards the end of the novel) at times. I mean, it's not like I wanted to read about blood spewing and rampant brutality or anything, but I just felt that things worked out a little too easily for what should have been slightly more complex, wear-and-tear inducing brawl. I really did like the whole idea of seeing the true reflection of your heart, character, and worth, within the eye of the sword, but there was a BIG hyped up "trial period" for Trevin while he was in Eldarra that took place before the sword came about and I kind of felt like things were, again, a little too easily fixed and remedied without much raucous uproar or a dynamic shift in the story as I would've loved to have seen. I'm Recommending This Book... While a few scenes seemed to come about a bit too easy for some of the characters along the way, the story of Trevin finding out more about himself and his heritage, while on his journey to find one of the harps for Melaia and King Laetham, quite excited me. It was refreshing to see the world of Camrithia through the eyes of a lowly comain who had much to learn about himself and a young princess' love to gain. Also, I must applaud Karyn Henley for painting her scenes so vividly, and for not being afraid to write out-of-the-ordinary and very much so unique beings into the literary world (such as the Draks, Wingwings and Malevolents.) I'm really looking forward to seeing how this series continues on in the years to come. This one gets a 4 out of 5 stars from me. 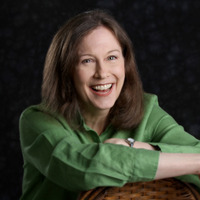 About The Author: Karyn Henley is a best-selling children's book author and an Emmy Award winning musician. She is the author of the original Beginner's Bible, which sold more than five million copies and was translated into more than fifteen languages, and Breath of Angel, the first novel in the Angelaeon Circle series. An accomplished songwriter, Karyn has been a Dove Award nominee and received a regional Emmy Award as music composer for a Christmas television special. She lives in Nashville, Tennessee. This book sounds very interesting. Would you recommend this for a reader who isn't a big fan of fantasy? Or would only a fantasy-fan appreciate it? 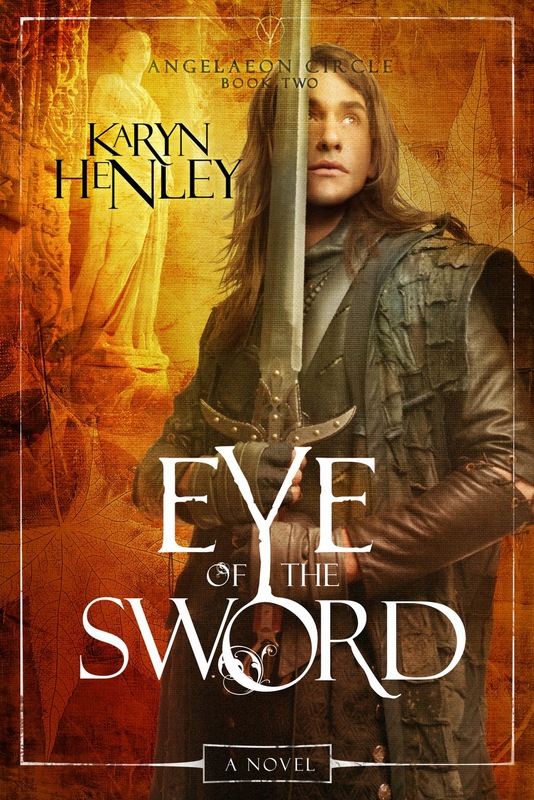 While Eye of the Sword is a Fantasy novel it didn't feel overly supernatural or dragon-y (if you catch my drift) in essence, so I'd wager that it would actually be a great read for someone who isn't a gung-ho fantasy nut like myself.